T.C. 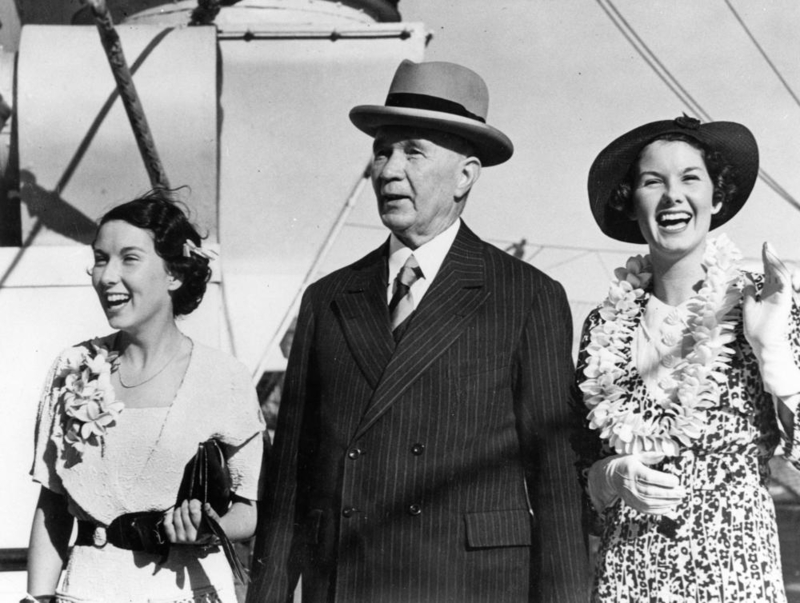 Beirne features prominently in local history, as a business leader who brought the modern department store to Queensland, and as a politician in the senate when the state still had an upper house. One of the stories that has lingered longest about Beirne is his rivalry with James McWhirter, who started out managing Beirne’s Fortitude Valley department store before setting up shop in competition across the street. Together, at the peak of modernity, these men established the Valley as Brisbane’s thriving retail centre. It was, of course, McWhirter’s department store that went on to become the city’s most renowned Art Deco landmark, with its majestic corner façade. Perhaps fewer people are aware of the role T.C. Beirne (below) also played in bringing Art Deco to Brisbane, albeit on a more humble scale. In 1934 he constructed Bulolo Flats, one of the city’s more curious Art Deco buildings, which today stands isolated on a busy thoroughfare that funnels traffic from the CBD to the Valley. 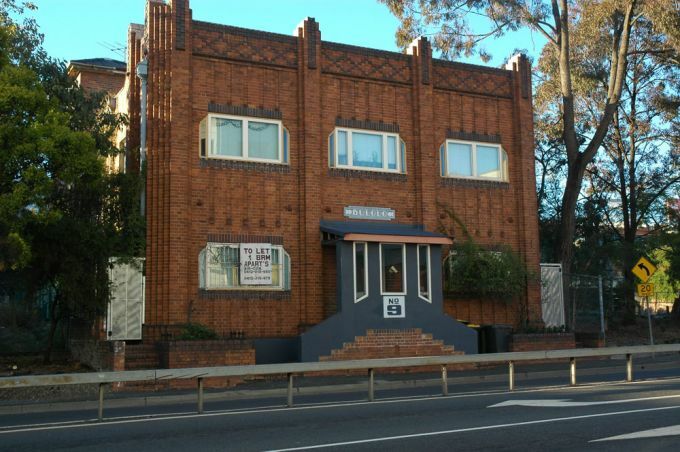 Beirne acquired the McLachlan Street site in early 1934, and in a matter of months had council approval to build a block of flats. At the time, Brisbane was experiencing a chronic housing shortage largely brought on by the economic depression and the consequent downturn in residential construction. Rental accommodation was in high demand and Beirne’s was one of several building projects that cropped up around the Valley and nearby New Farm. Coronet Flats, further down Brunswick Street and adjacent to New Farm Park, is another more famed example. Keeping business in the family, Beirne contracted his son-in-law’s architectural firm, Hennessy, Hennessy & Co., to design the building. The firm was a leader in the application of interwar architectural styles in Australia, and was responsible for other Art Deco landmarks in Brisbane such as the Colonial Life Mutual Building (now Manor Apartments) in Queen Street and the Forgan Smith Building at The University of Queensland. A hallmark feature of a Hennessy design is the use of polychromatic, textured brickwork, also evident in Bulolo Flats. Indeed, one of the building’s most striking features is the contrast of dark brown against red-orange brick, used to create simple patterns and highlights on the parapet, pilasters and window frames. Vertical fins, arranged most dramatically at the corners of the building and culminating in a stepped skyline, are another feature which clearly identify Bulolo Flats as a legacy of the Art Deco era. The word ‘Bulolo’ is also fashioned in Art Deco lettering above the front entrance, the flats named after the site of a PNG gold rush that was making news at the time. The flats are noteworthy not only for their decorative interest, but also for the social history they recall. T.C. Beirne constructed Bulolo Flats within walking distance of his Fortitude Valley department store (below) with his single, female employees in mind, particularly those who hailed from the country. 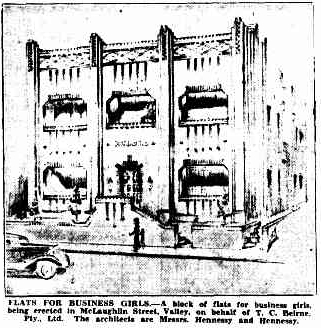 A Courier-Mail article about the proposed development specifically named ‘business girls’ as the target market for the flats, an equivalent to the more prevalent ‘bachelor flats’ for single, working men. Although other apartment accommodation existed for single women in Brisbane, Bulolo Flats was the only self-contained block in which bathroom facilities were not shared. There were eight flats in total, built across two levels, each containing a large bedsit with an adjoining sleepout/balcony, a kitchenette, a tiled bathroom with built-in bath and hot water geyser, and two entrances; one for private use and one for tradespeople delivering daily staples such as milk, bread, meat and vegetables. Perhaps for some tenants clothes washing became less of a chore, with the rooftop laundry facilities offering the added benefit of a view. The construction of Bulolo Flats in many ways pointed to the ambiguity people commonly felt about women’s growing emancipation. While on the one hand the flats supported young women in their pursuit of an independent life, on the other they were a response to the supposed ‘moral danger’ that ensued when single women, arriving in the city in droves to take up paid employment, lived under the same roof as single men in boarding houses and private hotels. 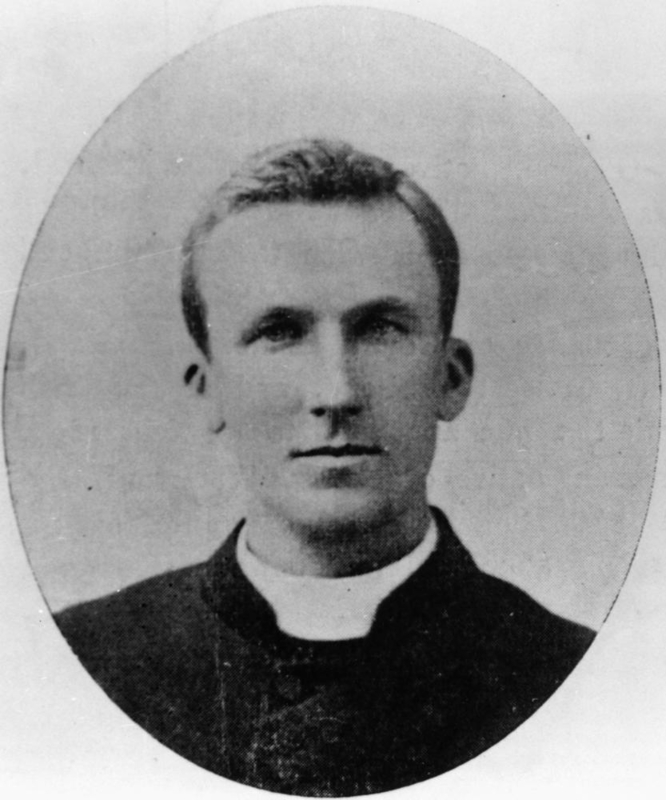 In the absence of records that shed direct light on Beirne’s personal views of these changing times, it is worth noting that his close friend and confidant was the Catholic Archbishop of Brisbane, James Duhig (below). Given Beirne was a devout Catholic himself and a major benefactor of the church, it is probable that Duhig’s values largely reflected Beirne’s own. In public addresses, Duhig encouraged people to ‘rejoice in women’s liberty’ but at the same time cautioned against the ‘degradation’ of women through drinking, smoking and immodest dress. He acknowledged the widening scope of opportunities for women with access to education, and praised women’s ‘courteous, obliging’ devotion to their work, but implored them to also use their ‘graces’ for the enrichment of domestic life. In the context of modern courting rituals, Duhig’s overriding concern was that ‘morally woman is not as protected as she should be, and when she falls she falls alone’. If Duhig’s views are taken as a proxy of sorts, it is not a stretch to conclude that Beirne saw himself as a protector of the moral virtue of the young women he employed. Bulolo Flats were indeed born from the strong sense of care and compassion for which Beirne was renowned, but at the same time they are an interesting case study in the paternalism that persisted during this time of flux, as women’s roles and expectations underwent an irreversible transformation. Today, the flats stand not only as a tribute to the enduring appeal of Art Deco design, but also as a reminder of the significant social and cultural changes which the spread of modernity brought to Queensland. Bulolo Flats was added to the Queensland Heritage Register in 2008. Feature image: Bulolo Flats. Courtesy of Must Do Brisbane. This photo may not be reproduced without permission of Must Do Brisbane. Illustration of Bulolo Flats. From ‘Flats for Girls in the Valley’. See reference below. Rear of T.C. Beirne and Co’s store in Fortitude Valley, Brisbane, 1902. Courtesy of State Library of Queensland. Haberdashery and glove department at T.C. Beirne, Fortitude Valley, 1900. Courtesy of State Library of Queensland. 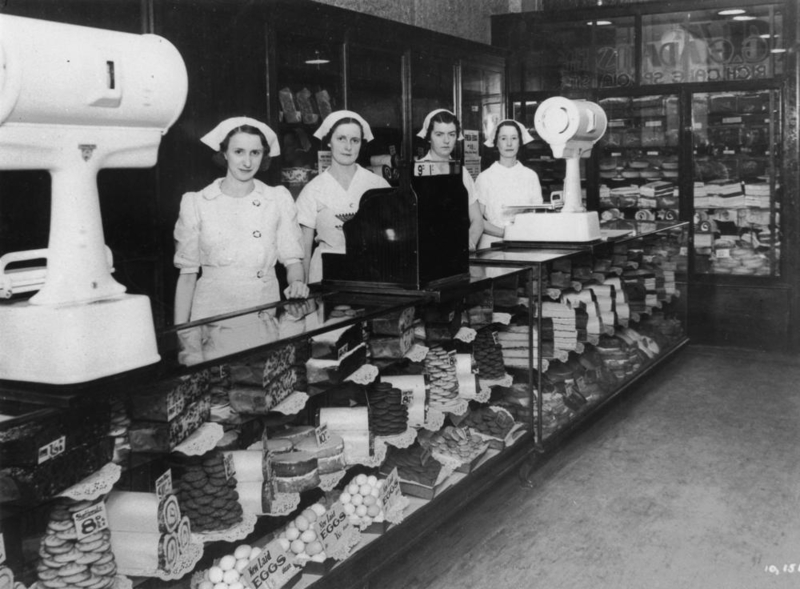 Shop assistants inside George Adams cake shop, Fortitude Valley, c.1938. Courtesy of State Library of Queensland. Archbishop Sir James Duhig. Courtesy of State Library of Queensland. ‘Bulolo Flats.’ Queensland Heritage Register. Department of Environment and Heritage Protection, Brisbane, 2008. ‘Family Life Menaced. Archbishop Duhig’s Warning. Degradation of Women.’ Morning Bulletin (Rockhampton). 12 February 1934, p.6. Ferguson, W.J. ‘Modern Woman.’ Townsville Daily Bulletin. 30 March 1933, p.3. ‘Flat for Girls in Valley.’ The Courier-Mail. 27 July 1934, p.25. ‘Lure of the City. Country Girls Singe Wings.’ The Northern Miner (Charters Towers). 10 September 1930, p.5. ‘Women’s High Ability in Business: Becoming dangerous rivals to men.’ The Courier-Mail. 6 December 1935, p.19. ‘Women’s Rights. Morally Unprotected. Archbishop Duhig’s Plea.’ The Brisbane Courier. 8 December 1930, p.13. Great and insightful post Iona! Brought me right back to Brissie on a Sunday night. Thank you very much for this story – I have often driven past this building and wondered about its past. TC Beirne was my great great grandfather, and although he died a quarter-century before his born, he still loomed large over my mother’s family while growing up. I’m fairly sure that the young women with him in the photo above are Hennessy women. One of them was (I think) Joan Garrett, a first cousin of my grandmother, who was a Hennessy and a granddaughter of TC Beirne – I recognise the shape of the eyes. This is a lovely story that I will share with relatives. I am also a great great grand daughter of TC Beirne, the two women in the photo with TC are Doreen and Joan Hooper my father’s sisters. loved reading the article, I have happy memories of the store when my father was the managing director.